Sunday 27 March and Project Merlot is spotted at Silverstone on the Grand Prix circuit along with over 100 other MX-5s belonging to MX-5 Owners Club members and Ma5da Racing teams. 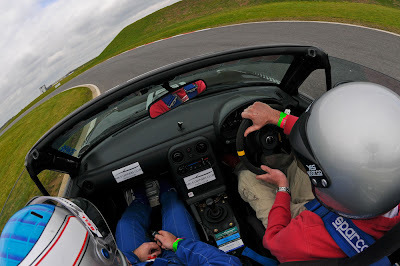 The parade lap, organised by the MX-5 Owners Club and Ma5da Racing was the biggest yet and gave all those on track a taste of what its like to be an F1 driver (well, sort of). There is a first time for everything and on Monday 21 March Team Merlot finally made it to Bedford Autodrome. Robbie and Jon took to the track on the event organise by Mazda on Track. ed (to return later, thankfully) along with plenty of rubber from what must be the longest lasting set of Toyo R888s anywhere, but so had the not so long lasting Red Stuff brake pads recently fitted to the Merlot. 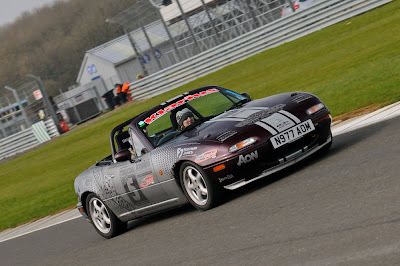 Sunday 27 March sees the first rounds of the 2011 Ma5da Racing championship at the new Silverstone circuit. 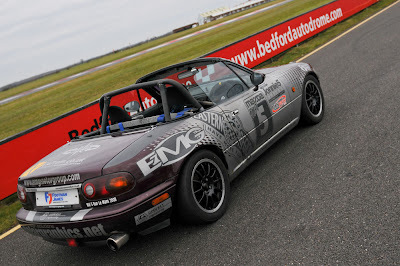 Project Merlot will be there along with up to 100 other MX-5 Owners Club cars and the 100 plus Ma5da Racing race cars for what should turn out to be a fantastic day. Owners Club members can apply for free admission tickets via the Club Forum, but be quick!